Create shape and texture with braids in this modern updo. Tis the season for prom, weddings and special occasion hair! In this advanced-level lesson, MODERN SALON Learning educator Jamie Carroll provides valuable tips on braiding and creating texture. Log onto modernsalonlearning.com today and try out this elegant updo on one of your clients. “Textured Sculpture” teaches you how to incorporate braids using eight simple sections. 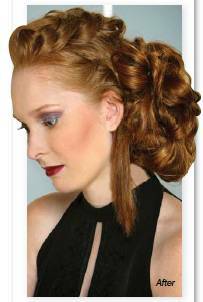 In this lesson, braid on an angle to allow volume and shape through the crown area. Learn how to utilize padding under the crown at the occipital area and easy techniques to cover the padding. 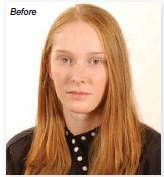 Use directional placement to create shape, texture and asymmetry while leaving workable texture at the front for volume if needed. Loosely braid the middle of the three back sections. 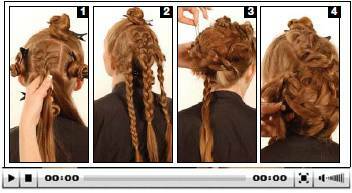 Braid the remaining hair of the middle section, loosen apart and secure the braid as done in the previous step. Working at the nape of the neck, wrap the fi rst braid around the padding and secure behind the ear using pins for volume. Working with the three braids above the hairpiece, wrap them loosely over and around the hairpiece and secure them behind the left ear. Leave ends out to fan behind the ear.